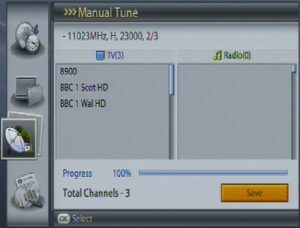 This Freesat & Freesat+ Setup Guide is based on the Humax FOXSAT-HD and Humax FOXSAT-HDR receivers, Setup on other brands and models may vary, see your Instruction Manual for details. 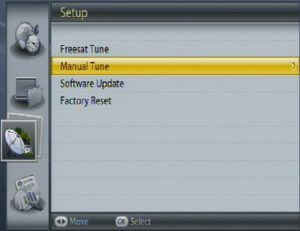 Under Setup, you can configure the installation settings, perform a Freesat Tune, Manual Tune, update software and restore the receiver to its Factory settings. A Freesat Tune will only list TV and radio channels currently listed on the Freesat EPG (Electronic Programme Guide). 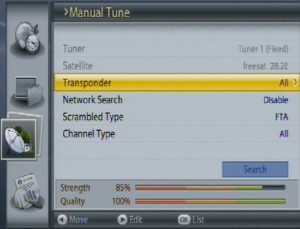 For all other Free-To-Air (FTA) channels, a Manual Tune is required. 2. Select Setup using the arrow keys and press the OK button. 3. 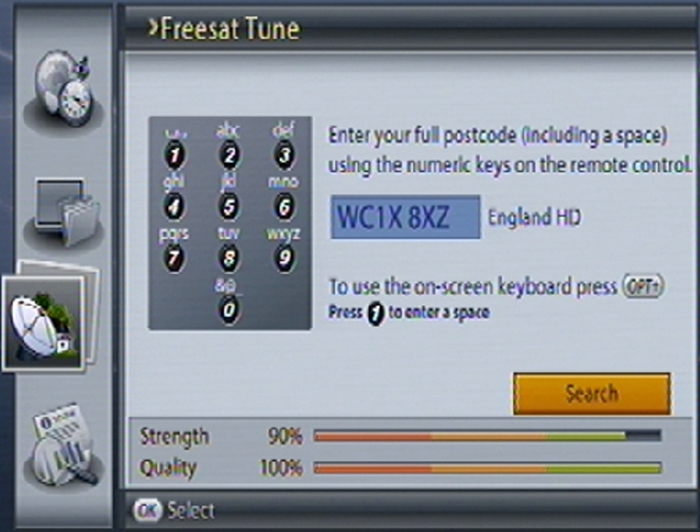 Select Freesat Tune using the S/T button and press the OK button. 4. Enter your region code (This is your full Postcode with a space in between). 5. 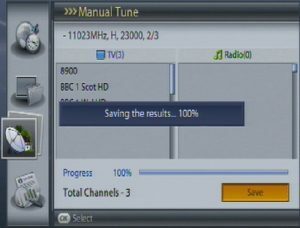 Please note that once you perform Freesat Tune, all Freesat channels will be deleted. 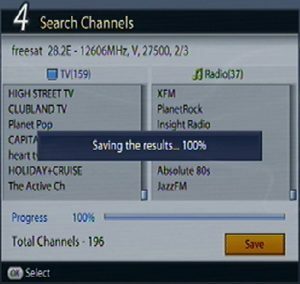 Select Yes and press the OK button to delete all freesat channels. Type in your postcode, this will decide which BBC One and ITV region you receive. 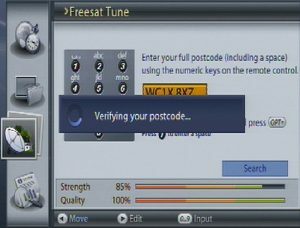 Verifying your postcode, this is part of the Freesat software, you can use any UK postcode. 3. Select Manual Tune using the arrow keys and press the OK button. 4. Select All or the value in the transponder list and press the OK button. If the required value is not available, select User Define and enter the transponder value directly. 5. Select Search and press the OK button. The channel search will start. 6. To stop the search, press the OK button during channel search. 7. The results will appear. Select Save and press the OK button. Choose the Transponder or transponders to be searched, by default all transponders will be searched. Here, a specific transponder is selected. 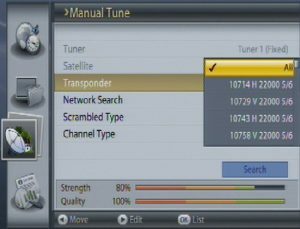 There are options to choose FTA and encrypted channels, TV & radio. Software Update allows you to update the system software to maintain the proper performance of the receiver. 3. 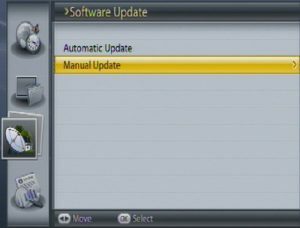 Select Software Update using the arrow keys and press the OK button. 4. Select Automatic Update and press the OK button. 5. When new software is detected, you can choose to download the software immediately or save for later. 6. When there is no new software to update, a popup will appear. Loading, software update is in progress. 1. Select Manual Update and press the OK button. 2. 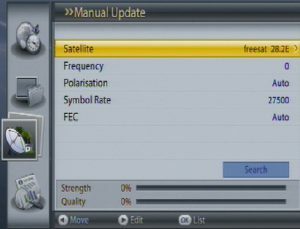 Enter the values for Satellite, Frequency, Polarization, Symbol Rate and FEC. 3. Select Search and press the OK button. 4. When new software is detected, you can choose to download the software immediately or save for later. 5. When there is no new software to update, a popup will appear. OTA, an abbreviation of Over-the-Air, is a standard for the transmission of software through a broadcast system. 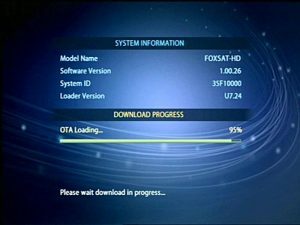 OTA is an alternative method for downloading software versions. However, the manufacturer’s reserve the right for deciding the release of the software for their products by transmitting the latest software versions over the air via satellite. 1. The equipment has the appropriate loader software. 2. The manufacturer decides to release the software via a designated satellite. 3. The equipment is tuned properly to the same antenna equivalent to that of Freesat (28.2°/28.5° East). 4. The signal strength and quality are high. If severe weather conditions or your location are affecting reception, for example, the software update should be postponed until signal strength and quality are favourable again. Please note that if the normal loader software is not equipped, the product may not be updated or operate properly after software update. Keep the power on and the power cord plugged in during the software update. If the power is off during software update, fatal damage may be caused to the receiver. Do not remove the antenna (LNB cable) during a software update. NOTE: It may take 5~10 minutes to update software. Other functions will not activate while the software update takes place. You cannot schedule programmes during the software update. When new software is detected, you can choose to download the software immediately or save for later. In case there is no software currently available, select Next and press the OK button to proceed to the next step. Factory Reset enables you to restore the product to the factory default. WARNING: Please note that once you perform Factory Reset, all data such as the antenna setting information, channel list and all user configured data will be deleted. NOTE: The default password is 0000. 2. Select Setup using the S/T button and press the OK button. 3. Select Factory Reset using the S/T button and press the OK button. 4. 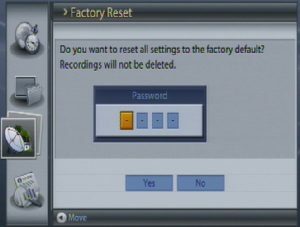 Select Yes and press the OK button to restore all setting to factory default. To return to the previous menu, select No and press the OK.
5. You will be prompted to enter your password again before starting to load factory reset. Enter the password to proceed. 6. 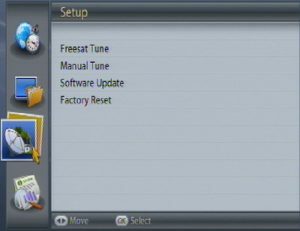 When the factory reset is completed, the first installation appears automatically and assists channel search.